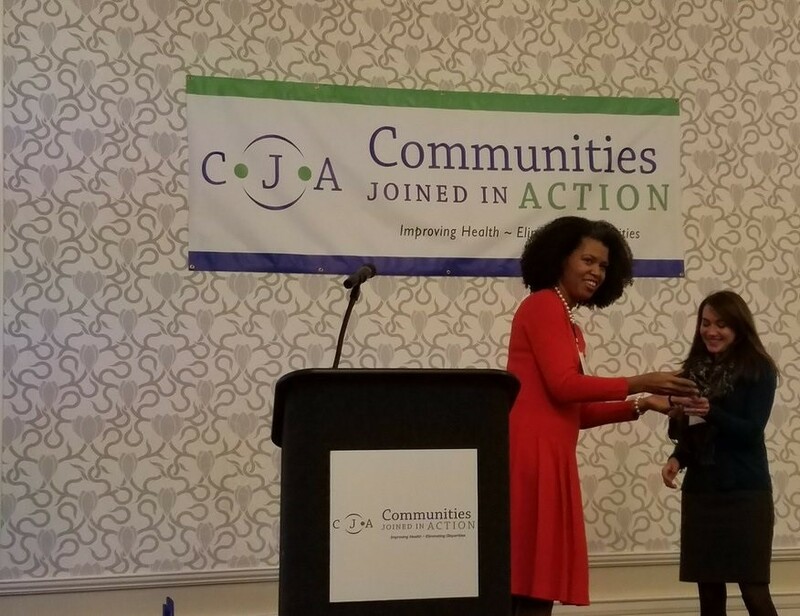 The Awards Committee for the 2017 Communities Joined in Action (CJA) National Conference requested membership nominations for this year’s awards on contributions to community health. The awards were presented during the Annual Conference held on February 15-17, 2017 at the Sheraton Gunter Hotel in San Antonio, Texas. 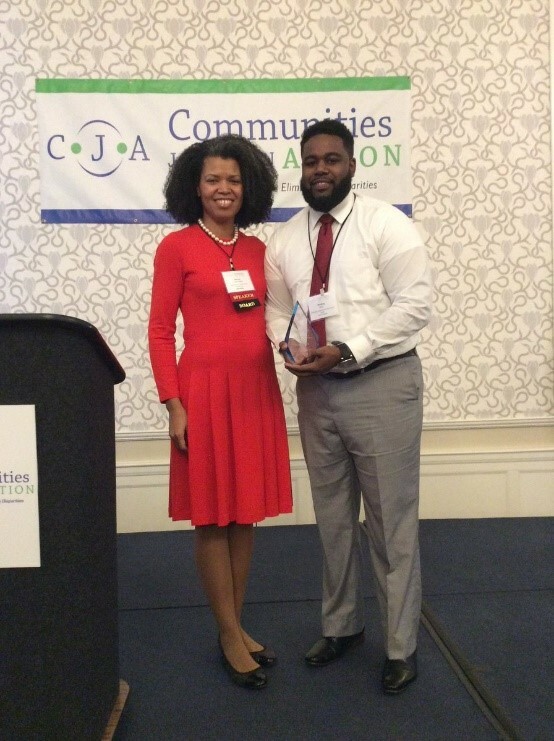 This is an award where CJA members recognize a replicable and transferable idea, tool, project, or learning that demonstrates a breakthrough model that achieves better health outcomes, addresses health inequities/disparities, improves access to health care or promotes a culture of health. The awardee would be invited to share their idea, tool, project or learning with the national membership on a webinar, or to include related documents as a resource for the CJA Library. The outcome/utility of this award will be to hardwire into CJA’s culture the dissemination of good ideas among the national community and to feature a “best in class” idea per year. This award may be given to an individual, an agency, or a coalition. Sarah Weller Pegna is a leader who has worked in the community to link clinical care to community resources through a cross organizational Alliance with the mission of Building Community Through Collaboration. This Alliance was formed as part of their community health assessment process co-led by the health department and hospital and became the main link between agencies focused on improving health. This structure created a forum to create new initiatives to ensure that healthcare does not end when a patient leaves the hospital or clinic. This leader stepped into this forum and successfully implemented an initiative that was sorely needed in the community. Ms. Pegna succeeded where others had not and brought the Exercise in Medicine program to life in her community. This initiative links medical providers with local physical activity opportunities that are “prescribed” to patients. Patients are able to fill their prescription local gyms, parks, and recreational facilities. Providers now have a way to make concrete referrals for physical activity and work closely with their community partners. This year’s health transformation leader has shown the strong leadership, perseverance and relationship building that was needed to implement this cross-sector program. A challenge her community aced for many years and hadn’t been able to solve. We look forward to this leader sharing this successful initiative with other communities across the country. This is a membership nominated award where CJA members can nominate an early career professional, community leader or practitioner who has served in a management capacity for a minimum of five years and under 40 years of age. The nominee must have demonstrated a commitment to achieving health equity and engaging with community collaboratives/coalitions. Nominations must be endorsed by the organizational leader, community advisory board or similar entities that can endorse support for the nominee. This award is designed to recognize and retain talent in the community health industry and at the community level. Weyling White is a coordinator for community health maintenance alliance that focuses on upstream issues impacting community health. In a very short time, he has implemented a donated care network, a Community-Centered Health initiative linking healthcare providers to community change, convened transportation summits to expand transportation options, and helped develop a Youth Wellness Academy, an empowerment program for students. Mr. White has played a vital role in uniting community partners and healthcare, breaking down the silos that so many times separates healthcare from community partners. Weyling continually strives to advocate for the needs of the patients he serves: the low income uninsured or underinsured residents of his community. He has worked to ensure that these patients have access to quality healthcare and community resources and that their voices are heard. 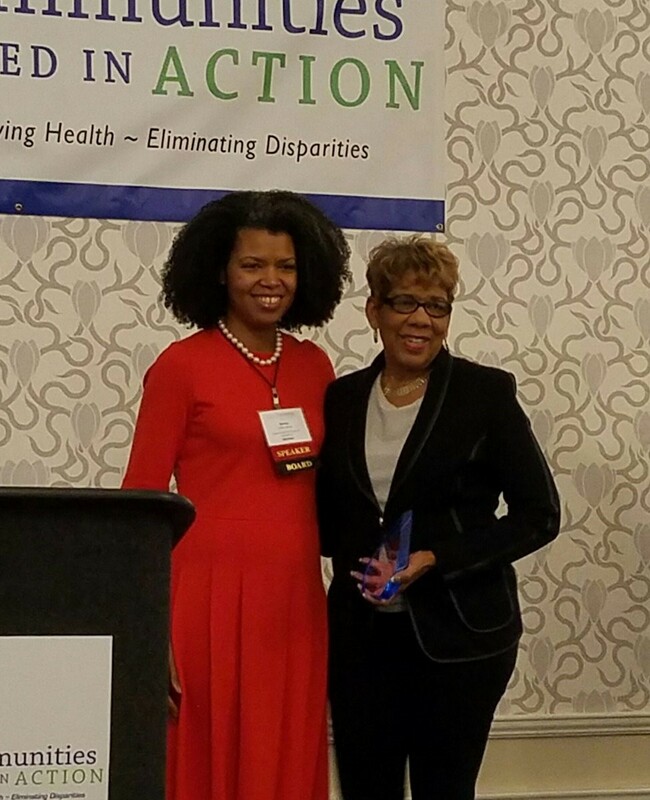 This is a membership nominated award where CJA members recognize a leader who has broad influence on theory, policy, and/or practice addressing health disparities and improving health outcomes. The awardee can be a CJA member or non-member. The award recipient will be invited to share their experience with the national membership on a webinar with a goal of increasing community level influence. The purpose of this award is to demonstrate the power of community level impact and dedication to social justice through the use of data, cultural competency, governance, and leadership. 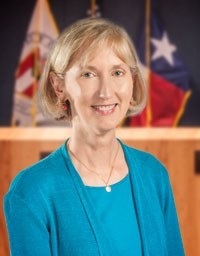 Ann Kitchen is a Council Member for District 5 (South Austin) Chairs the City of Austin’s Mobility Committee. She is a former assistant attorney general in the consumer protection division and a former State Representative. In the legislature she is best remembered for her contributions to House Bill 1156, which expanded women’s access to health care and Senate Bill 11, the Medical Records Privacy Act. After leaving the legislature, she was Executive Director of the Indigent Care Collaboration (ICC) a regional collaboration of public and private hospitals, clinics and MHMR, public health departments, university medical departments and medical society responsible for providing care for uninsured individuals. Councilwoman Kitchen has always been a champion for health equity. In less than one year in office she has helped the city establish health equity as one of three of its primary goals. She is an attorney and health care consultant, with an expertise in improving access to health care services for women and families, including hospital district programs, county indigent health care programs, CHIP, Healthy Kids and Medicaid, family planning, women’s health, health care reform and other programs. She has over ten years of state service as a Senior Medicaid Policy Advisor with the Texas Health and Human Services Commission. Councilwoman. Kitchen has been a stalwart leader in her community and is dedicated to social justice and health equity. This is a membership nominated award where CJA members recognize a leader with specific skills in organizing grassroots participation and/or utilizing the political process to advance access work. As part of this award, the leader would be invited to feature their learnings on a webinar, with the goal of encouraging deeper community-level perspective and/or more effective political savvy among the CJA membership. The outcome/utility of this award will be to hardwire into CJA’s culture a value for community-level organizing and political savvy, and to feature a “best in class” discussion per year. This award may be given to an individual, an agency or a coalition whose idea, tool, project, or learning that has value in community safety net care. The awardee would be invited to share their idea, tool, project or learning with the national membership on a webinar, or to include related documents as a resource for the CJA library. The outcome/utility of this award will be to hardwire into CJA’s culture the dissemination of good ideas among the national community and to feature a “best in class” idea per year. This award may be given to an individual, an agency, or a coalition. This is an award that is nominated by members of the CJA Executive Board to recognize individuals who have made an impact and investment in the national community. Judith Warren has a long career and history of providing leadership in healthcare and philanthropy, having an impact at the community, state and national level. She has been a senior program officer for a foundation where she coached and mentored grantees and was instrumental in the foundation’s decision making on grants. Ms. Warren has received numerous awards and recognitions for leadership and innovations that have transformed peoples’ lives. She founded and currently leads a regional community based organization that is implementing models of delivery that have had a profound impact on the lives of the underserved. She has been recognized by her state with awards for this work. She has been appointed by the Governor of her state to bring her knowledge, skills and expertise to bear across her state. Ms. Warren is a tireless volunteer leader, innovator and manager of CJA from member to chair of committees, to officer positions. Her contributions across the nation have been experienced by CJA members as she has successfully guided this organization.